The C42 is an innovative modern two seat aeroplane that is setting new standards in the 450Kg Microlight class. Over 600 of these comfortable, affordable and go anywhere aircraft are now flying in Europe and around the world. They are built by COMCO in Germany – a company widely recognised for it’s quality aircraft. 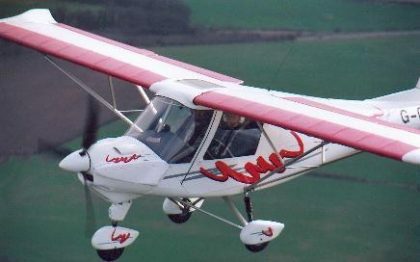 The Ikarus C42 offers superior handling characteristics as well as stability and ease of control both in the air and on the ground. Low operating costs, no C of A and folding wings keep the cost of ownership down to a minimum.